After lining up Vince Staples, A Tribe Called Red and more for their inaugural event last year, organizers behind Vancouver's Westward Music Festival have now lifted the curtain on the lineup for the fest's 2018 edition. 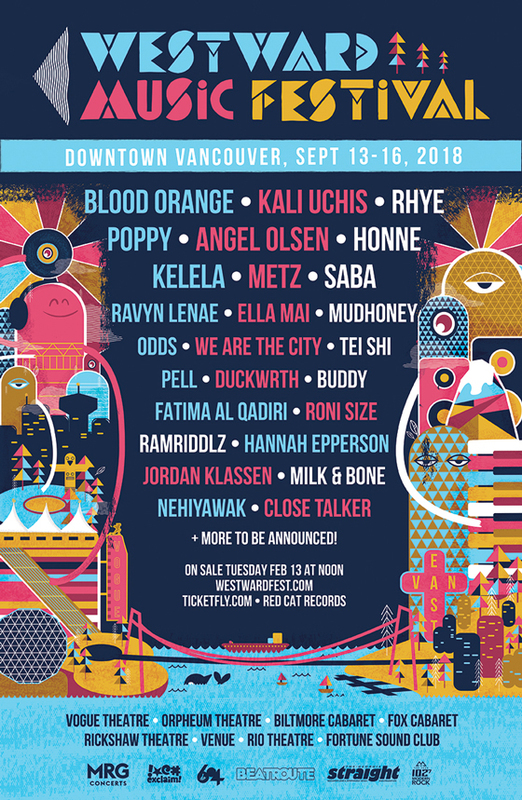 Taking place across Vancouver from September 13 to 16, this year's lineup finds Blood Orange and Kali Uchis atop the bill, followed closely by Rhye, Mudhoney, Poppy, Angel Olsen, Honne, Kelela, METZ, Saba, Ravyn Lenae, the Odds, Roni Size, Buddy, Close Talker, Ella Mai, Fatima Al Qadiri, We Are the City, Milk & Bone, and Tei Shi, among others. More acts are also set to be announced. "The MRG Concerts team and myself are very much looking forward to the 2018 edition of Westward," MRG Group president and founder Matt Gibbons said in a statement. "Due to the incredible support from Vancouver over the past year, we have been able to grow the festival to include more shows and venues, all while keeping with our mission to provide the city's music fans the memorable experiences they are looking for." Tickets for the festival are currently available through a pre-sale, with general tickets available on February 13 at 12 p.m. PST. Further information can be found through the festival's official website.